Note: Download speed can ever exceed the bandwidth cap. What you need for this hack? 1. Latest version of U torrent. 2. Some special settings on Utorrent. 3. Some smart tricks to get trackers. 1. First of all download the Utorrent latest version. You can Google it to download as its a freeware. Its always preferable to download the installer from their home website because if you download the installer from other website it might be consisting some additional toolbars or tracking freewares. 2. Now Install the Utorrent and Start it. 3. Now Go to options and do the following settings shown in the snapshots. 4. Now you setting part has been over. Now for getting good High speed torrents visit the website torrentz . com (remove spaces between . and com). 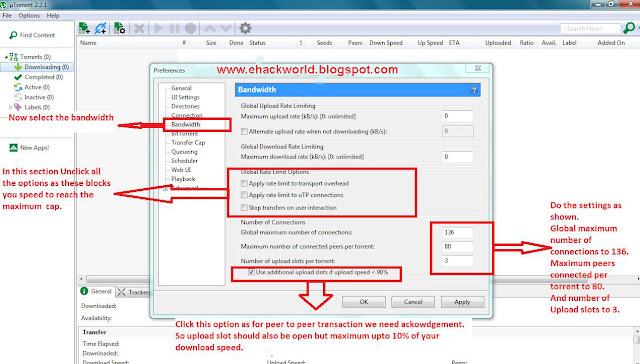 Now suppose you want to download any torrent Choose the torrent which has maximum peers and have minimum leechers. Peer means : The particular torrent exist on that many systems. Leecher : It means particular number of people are downloading the following torrent. Hope you all like my post...Then please comment. it doesn't works can u help? It Worked Only 1 Time Not Its Not Working !